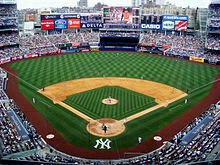 Yankee Stadium is a baseball park located in Concourse, Bronx, New York City. It is the home field for the New York Yankees of Major League Baseball (MLB), and New York City FC of Major League Soccer (MLS). The $2.3 billion stadium, built with $1.2 billion in public subsidies, replaced the original Yankee Stadium in 2009. It is located one block north of the original, on the 24-acre (9.7 ha) former site of Macombs Dam Park; the 8-acre (3.2 ha) site of the original stadium is now a public park called Heritage Field. Groundbreaking ceremonies for the stadium took place on August 16, 2006, the 58th anniversary of Babe Ruth's death, with Steinbrenner, Bloomberg, and then-Governor of New York George Pataki among the notables donning Yankees hard hats and wielding ceremonial shovels to mark the occasion. 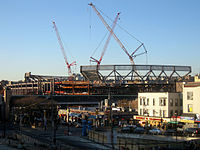 The Yankees continued to play in the previous Yankee Stadium during the 2007 and 2008 seasons while their new home stadium was built across the street. The community was left without parkland for five years. 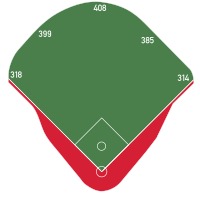 The outfield fences measure 8 feet 5 inches (2.57 m) high from the left-field foul pole until the Yankees' bullpen, when the fences begin to gradually descend in height until the right field foul pole, where they are 8 feet (2.4 m) tall. This also marks a decrease from the previous Yankee Stadium, where the outfield walls stood at a height of approximately 10 feet (3.0 m). The distance from home plate to the backstop is 52 feet 4 inches (15.95 m), a reduction of 20 feet (6.1 m) from the previous facility. The field is made up of Kentucky bluegrass, the same surface as the previous stadium, which is grown on a 1,300 acres (530 ha) farm in Bridgeton, New Jersey. The grass is equipped with a drainage system (featuring over 14,000 feet (4,300 m) of pipe) that makes the field playable an hour after taking 2 inches (51 mm) of rain. The center field scoreboard, manufactured by Mitsubishi Diamond Vision, measures 59 x 101 feet (31 m) and offers 5,925 square feet (550.5 m2) of viewing area. It was the third-largest high definition scoreboard in the world when it opened (behind the 8,736-square-foot (811.6 m2) board at newly renovated Kauffman Stadium and the new 8,066-square-foot (749.4 m2) board at the renovated Tokyo Racecourse). Since then, it has also been surpassed by the world's largest scoreboard at AT&T Stadium and the new scoreboard at the Philadelphia Phillies' Citizens Bank Park. Displaying 5,925 sq ft (550.5 m2) of video, the scoreboard can display four 1080p high definition images simultaneously. 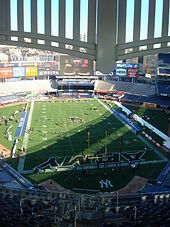 Yankee Stadium is accessible by car via the Major Deegan Expressway (I-87), with connections to the Cross Bronx Expressway (I-95), Bruckner Expressway (I-278), and other highways and roads. Aside from existing parking lots and garages serving the stadium, construction for additional parking garages is planned. The New York State Legislature agreed to $70 million in subsidies for a $320 million parking garage project. On October 9, 2007, the New York City Industrial Development Agency approved $225 million in tax-exempt bonds to finance construction of three new parking garages that will have 3,600 new parking spaces, and renovation of the existing 5,569 parking spaces nearby. Plans initially called for a fourth new garage, but this was eliminated before the final approval. The garages will be built (and renovated) by the Community Initiatives Development Corporation of Hudson, a nonprofit entity that will use the parking revenue to repay the bonds and pay a $3 million yearly land lease to the City of New York. Parking is expected to cost $25 per game. A New York University graduation ceremony took place on May 13, 2009, with the address being delivered by U.S. Secretary of State and former New York Senator Hillary Clinton. The 2010 NYU ceremony featured alumnus Alec Baldwin as a speaker. President Bill Clinton spoke at the 2011 ceremony. On April 3, 2016 episode of the HBO news-comedy series Last Week Tonight, host John Oliver responded to Trost's remarks, arguing that he was "saying that rich people couldn't bear to sit next to people who aren't as rich." As a further satire of Trost's arguments against discounted resale, Oliver then announced a contest in which viewers were invited to send photos of themselves dressed as if they had "never sat in a premium location before", with winners offered the ability to purchase a pair of Legends Seats from one of the first three home games of the season for 25 cents. The stunt was successful, leading to the presence of several costumed attendees in Legends Seats during the opening games. Team president Randy Levine responded positively to the stunt, thanking Oliver for having bought tickets to begin with, and remarked that everyone was welcome at Yankee Stadium. ^ "The House That Jeter Built". MLB.com. Retrieved November 19, 2014. ^ Russ, Hilary. "New York Yankees baseball team to refinance $1 billion of stadium debt". Reuters.com. ^ a b "S&P raises Yankee Stadium bonds to 'BBB'". Reuters.com. ^ Brown, Maury. "Yankees parent group carrying nearly $2 billion in debt". TheFreeLibrary.com (Business of Sports Network). ^ "2018 Official Media Guide and Record Book". Major League Baseball Advanced Media. February 22, 2018. p. 347. Retrieved April 13, 2018. ^ "New York Yankees on the Forbes MLB Team Valuations List". Forbes. April 11, 2017. Retrieved April 11, 2017. ^ Kronheim, David P. (2016). "2015 MLB Attendance Analysis" (PDF). Flushing, NY: Number Tamer. pp. 11, 165. Retrieved February 18, 2017. ^ "New York Yankees on the Forbes MLB Team Valuations List". Forbes. March 25, 2015. Archived from the original on June 4, 2015. Retrieved April 11, 2016. ^ Marchand, Andrew; Matthews, Wallace (March 25, 2014). "Question 4: Will Jeter Lure 4 Million Fans?". ESPN. Retrieved March 26, 2014. ^ Perrotto, John (October 12, 2012). "Yankee Stadium Sea of Blue – Empty Seats – at Game Time". USA Today. Retrieved March 16, 2013. ^ Shpigel, Ben (October 14, 2010). "Vazquez's Final Pitch in Pinstripes?". The New York Times. Retrieved April 17, 2014. ^ Booth, Mark. "What's New for NYCFC This Season?". NYCFC.com. Retrieved August 29, 2017. ^ a b c "New York City FC outline plans for Yankee Stadium's baseball-to-soccer conversion". Major League Soccer. April 21, 2014. Retrieved April 21, 2014. ^ "Notre Dame Shut Downs Army, Rolls In New Yankee Stadium Debut". University of Notre Dame Official Athletic Site. Associated Press. November 20, 2010. Retrieved January 11, 2016. ^ "Tigers Beat Yankees 3-2, Head to ALCS vs Texas". Sports Illustrated. Associated Press. October 6, 2011. Retrieved March 16, 2013. ^ "Yankee Stadium". Populous. Retrieved March 10, 2013. ^ a b Scarangello, Thomas Z.; Squarzini, Michael J. (July 2009). "New Yankee Stadium respects its rich history". Structural Engineer. Archived from the original on October 21, 2013. Retrieved September 19, 2011. ^ "Yankee Stadium". Ballparks Munsey and Suppes. Retrieved March 16, 2013. ^ "NYC baseball stadium subsidies: Do I hear $1.8B?". Field of Schemes. Retrieved May 28, 2015. ^ "Bonus Season for Baseball". The New York Times. January 17, 2002. Retrieved May 5, 2010. ^ "Yankees break ground on new $1 billion home". ESPN. Associated Press. August 16, 2006. Retrieved August 16, 2006. ^ "New Yankee Stadium". Major League Baseball Advanced Media. Retrieved August 16, 2006. ^ Lengel, David (April 17, 2007). "Yankees Dig Deep to Rid New Stadium of Curse". The Guardian. London. Retrieved May 5, 2010. ^ "Jimmy Fund Auctions Buried Red Sox Jersey On eBay". WBZ. Boston. Associated Press. April 17, 2008. Retrieved July 19, 2008. ^ "History of the Jimmy Fund". Jimmy Fund. Archived from the original on June 15, 2008. Retrieved July 19, 2008. ^ Schmidt, Michael S. (May 20, 2008). "Yanks May Be Scratching Surface of Sox Items at New Stadium". The New York Times. Retrieved January 16, 2010. ^ Kernan, Kevin (November 10, 2009). "No Papi Jinx for Yankees". New York Post. Retrieved January 16, 2010. ^ a b c d e f g "Tour the new House – Welcome Home". New York Daily News. Archived from the original on April 5, 2009. Retrieved April 10, 2009. ^ "Tour the New House – The Daily News on Display". New York Daily News. Archived from the original on April 3, 2009. Retrieved April 10, 2009. ^ a b c d e f g h i j k l m "Tour the New House – A Closer Look". New York Daily News. Archived from the original on April 5, 2009. Retrieved April 10, 2009. ^ a b c d "New Yankee Stadium Comparison". Major League Baseball Advanced Media. Retrieved September 26, 2008. ^ Sandomir, Richard (April 14, 2009). "A Distinctive Facade Is Recreated at New Yankee Stadium". The New York Times. Retrieved May 5, 2010. ^ a b c d e f g "Tour the New House – Hall of a Place". New York Daily News. Archived from the original on April 3, 2009. Retrieved April 10, 2009. ^ Brown, Maury (December 19, 2007). 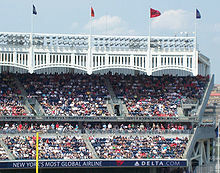 "Daktronics: Video System for New Yankee Stadium". Biz of Baseball. Retrieved December 19, 2007. ^ Abraham, Peter (June 17, 2009). "Dog Bites (Krazy) Man". The Journal News. Retrieved June 17, 2009. ^ Coffey, Wayne (February 25, 2009). "Babe Ruth, Other Monuments Settle in New Yankee Stadium Home". New York Daily News. Retrieved March 1, 2009. ^ Yes Network broadcast of Yankees vs. Cubs, April 3, 2009. 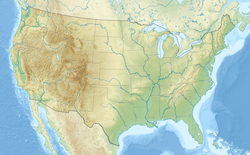 ^ a b "AccuWeather: Smaller Stadium Causes HR Surge". Newsday. Associated Press. June 9, 2009. Retrieved January 16, 2010. ^ a b c d e Kepner, Tyler (April 20, 2009). "Over the Wall and Under the Microscope in the Bronx". The New York Times. Retrieved May 23, 2009. ^ "Kansas City Royals to Get 'World's Largest' HD LED Scoreboard". End Gadeget. October 3, 2007. Retrieved May 18, 2009. ^ MJD (June 12, 2008). "Jerry Jones Aims to Make All Cowboys' Fans Blind by 2010". Yahoo! Sports. Retrieved November 28, 2008. ^ Fraser, Adam (January 21, 2011). "Daktronics Takes Phillies' Screens to Next Level". SportsPro Media. Retrieved January 21, 2011. ^ a b c d e "Tour the New House – Inside the Clubhouse". New York Daily News. Archived from the original on April 5, 2009. Retrieved April 10, 2009. ^ a b c d "Tour the New House – Pinstripe Pride". New York Daily News. Archived from the original on April 5, 2009. Retrieved April 10, 2009. ^ Bloomberg News (June 18, 2008). "New York Yankees-Owned Steakhouse Will Be Part of New Stadium". New York Daily News. Retrieved January 16, 2010. ^ a b c d e Green, Sarah (May 5, 2009). "New Yankee Stadium Strikes Out With Customers". Harvard Business Review. Retrieved May 7, 2009. ^ a b c Kepner, Tyler (May 6, 2009). "New Home, New Atmosphere". The New York Times. Retrieved May 7, 2009. ^ Miller, Scott (October 29, 2009). "Yankees Create No Excitement, and Now Pressure's On". CBS Sports. Retrieved October 31, 2009. ^ Best, Neil (October 29, 2009). "Empty Seats at Yankee Stadium Not What They Seem". Newsday. Retrieved October 31, 2009. ^ "#1 New York Yankees". Forbes. March 23, 2011. 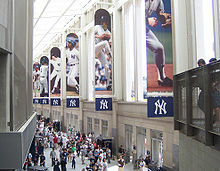 ^ "Yankee Stadium Enhancements". New York Yankees. Retrieved May 16, 2017. ^ a b c d Gagne, Matt (May 6, 2009). "Fallout From Yankeegate Lingers with Stadium Workers, Irate Fans". New York Daily News. Retrieved May 7, 2009. ^ Rashbaum, William K.; Belson, Ken (October 23, 2009). "Cracks Emerge in Ramps at New Yankee Stadium". The New York Times. Retrieved October 24, 2009. ^ Raissman, Bob (July 30, 2012). "ESPN critiques of new Yankee Stadium keeps building on broadcasts". New York Daily News. Retrieved July 31, 2012. ^ Passan, Jeff (October 15, 2012). "Yankees Deserve Boo-Birds and Empty Seats After Looking Like $200M bust in ALCS". Yahoo! Sports. Retrieved October 15, 2012. ^ "Mo Rivera: Old Yankee Stadium Had Far Better Atmosphere Than New One « CBS New York". Retrieved May 28, 2015. ^ a b c Olney, Buster (April 21, 2009). "New Yankee Stadium on Steroids?". ESPN. Retrieved May 23, 2009. ^ a b Matthews, Wallace (May 20, 2009). "Home Runs a Cheap Thrill at Yankee Stadium". Newsday. Archived from the original on May 25, 2009. Retrieved May 23, 2009. 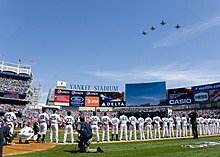 ^ a b "Yankee Stadium: Biggest Joke in Baseball". New York Post. Associated Press. May 22, 2009. Retrieved May 23, 2009. ^ Keown, Tim (April 28, 2009). "Trouble at the House that George Built". ESPN. Retrieved May 23, 2009. ^ "Phillies' Ruiz Finishes Yanks in 11th, Takes Lidge Off Hook". ESPN. Associated Press. May 29, 2009. Retrieved May 29, 2009. ^ Olney, Buster (May 23, 2009). "Too Many Homers to Right? Add a Chicken Coop". ESPN. Retrieved May 23, 2009. ^ a b Feinsand, Mark (April 21, 2009). "Homer's Odyssey: News Tries to Solve New Yankee Stadium's Quandary". New York Daily News. Retrieved May 23, 2009. ^ a b c Dittmeier, Bobbie (June 10, 2009). "Study: Design Cause of Stadium Homers". Major League Baseball Advanced Media. Retrieved June 10, 2009. ^ Sciacco, Steve (August 11, 2009). "The New Stadium's a Bandbox". Yankee Analysts. Archived from the original on April 4, 2015. Retrieved March 16, 2013. ^ Hoch, Bryan (September 14, 2009). "Guerrero's Homer Sets Yankee Stadium Mark". Major League Baseball Advanced Media. Retrieved September 17, 2009. ^ "Major League Teams, 2009". Fangraphs 2009 Splits by Team. Fangraphs. Retrieved June 25, 2011. ^ a b "Ballpark Detail". Hit Tracker Online. Retrieved March 16, 2013. ^ "2011 Major League Baseball Season Summary". Baseball Reference. Retrieved March 16, 2013. ^ Kepner, Tyler (April 16, 2009). "Getting Ready for the Real Thing". The New York Times. Retrieved April 16, 2009. ^ "Cleveland 10, New York 2". USA Today. April 16, 2009. Archived from the original on April 20, 2009. Retrieved April 16, 2009. ^ DiComo, Anthony (September 12, 2009). "Jeter Passes Gehrig with 2,722nd Hit". Major League Baseball Advanced Media. Retrieved April 15, 2011. ^ Britton, Tim (August 4, 2010). "A-Rod Youngest in History to 600 Homers". MLB.com. Retrieved September 5, 2011. ^ Hoch, Bryan (July 9, 2011). "With Homer, Jeter Joins 3,000-Hit Club". Major League Baseball Advanced Media. Retrieved July 11, 2011. ^ Hoch, Bryan (August 25, 2011). "Yanks Rout A's with MLB Record Three Slams". Major League Baseball Advanced Media. Retrieved August 26, 2011. ^ Taube, Aaron (September 19, 2011). "Rivera New Saves King as Yanks Top Twins". Major League Baseball Advanced Media. Retrieved July 21, 2011. ^ AP Sports [@AP_Sports] (April 21, 2016). "Kendall Graveman became the first starting pitcher to bat at the current Yankee Stadium" (Tweet) – via Twitter. 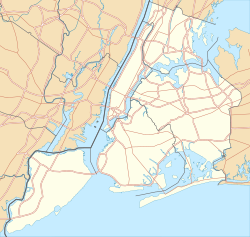 ^ "Train Service to MTA Metro-North Railroad's Newest Station Yankees – E. 153rd Street Begins Saturday May 23, 2009" (Press release). Metro-North Railroad. April 1, 2009. Retrieved January 16, 2010. ^ "Events". SeaStreak. Retrieved December 18, 2011. ^ "More Soccer At Yankee Stadium: AC Milan vs. Real Madrid In August!". Gothamist. May 24, 2012. Archived from the original on May 26, 2012. Retrieved May 23, 2012. ^ "Spain 2 Republic of Ireland 0". Daily Mail. London. June 12, 2013. Retrieved June 12, 2013. ^ "Yankee Stadium Dimensions Cramping New York City FC's Style". Wall Street Journal. New York City. Retrieved May 28, 2015. ^ Hoch, Bryan (July 20, 2009). "Yanks to Host Notre Dame-Army Game". Major League Baseball Advanced Media. Retrieved January 16, 2010. ^ "Sanu Sets Big East Record, Rutgers Outlasts Army". The Wall Street Journal. Associated Press. November 12, 2011. Retrieved December 1, 2011. ^ "First Pinstripe Bowl to Be Held Dec. 30". ESPN. Associated Press. March 9, 2010. Retrieved May 20, 2010. ^ "MD-Rutgers game moved from Yankee Stadium". ESPN.com. Retrieved December 27, 2017. ^ Klein, Jeff Z. (January 24, 2014). "At Yankee Stadium, Rangers Will Share Glamour with Rivals". New York Times. Retrieved January 26, 2014. ^ Hardeep Phull (September 7, 2012). "Madonna scores at Yankee Stadium". New York Post. Retrieved September 8, 2012. ^ "Madonna Treats Yankee Stadium To A Holiday On Her MDNA Tour!". PerezHilton.com. September 9, 2012. Retrieved September 30, 2013. ^ Jeff Rosenthal (July 20, 2013). "Jay Z and Justin Timberlake Take Over Yankee Stadium as Legends of the Summer". Rolling Stone. Retrieved February 29, 2016. ^ "Garth Brooks/Yankee Stadium/Live". DirecTV. Retrieved November 11, 2016. ^ Weichselbaum, Simone; Schapiro, Rich (June 6, 2010). "Yankee Stadium Slugfest: Miguel Cotto Beats Junior Middleweight Champ Yuri Foreman". New York Daily News. Retrieved June 7, 2010. ^ Gibson, David (April 19, 2009). "God's Will in Hard Times". New York Magazine. Retrieved January 16, 2010. ^ Paddock, Barry (May 12, 2010). "'30 Rock's' Alec Baldwin Ditches Comedy for Emotional Speech to NYU Graduates at Yankee Stadium". New York Daily News. Retrieved March 16, 2013. ^ "President Bill Clinton to Speak at NYU's 2011 Commencement". New York University. March 8, 2011. Retrieved April 30, 2011. ^ "Here's why the Yankees are getting rid of print-at-home tickets". Washington Post. Retrieved March 17, 2016. ^ "New York City fans left stranded over ticket farce in Toronto draw". ESPN FC. ESPN. Retrieved March 17, 2016. ^ "Nobody Could Get Into The NYCFC Game At Yankee Stadium Because Of The Yankees' Stupid Ticket Policies". Deadspin. Retrieved March 17, 2016. ^ "Yankees exec gets snobby when defending new ticket policy". Yahoo! Sports. Retrieved March 17, 2016. ^ "Yankees glad John Oliver is a paying customer". ESPN.com. Retrieved July 10, 2016. ^ "John Oliver Offers Premium Yankees Seats for 25 Cents Apiece on 'Last Week Tonight'". Speakeasy (The Wall Street Journal). Retrieved July 10, 2016. ^ "John Oliver sent 'riff-raff' dressed as unicorns and 'left sharks' to the Yankees game". Washington Post. Retrieved July 10, 2016. ^ "StubHub Will Serve as Yankees' Ticket Reseller". The New York Times. Retrieved July 10, 2016. ^ Isidore, Chris (June 27, 2016). "Yankees reach deal with StubHub". CNN Money. Retrieved June 28, 2016.